We’re celebrating nine decades! yes, that’s right. We have been making men’s wool shirts for ninety years. The Pendleton shirt story starts in 1924, when the Bishop family decided to enlarge their business from trade and bed blankets into men’s apparel. In 1924, a man could have a wool shirt in any color he wanted – as long as it was grey. Wool shirts were utilitarian items; warm, durable, an excellent first line in the defense against the elements. They were uniformly drab. Of course, all that was about to change. At Pendleton Woolen Mills, Clarence Morton Bishop envisioned a different kind of fabric for a man’s wool shirt. Pendleton’s sophisticated weaving capabilities were producing vibrant Indian trade blankets. Why not bring that same weaving and color know-how to flannel shirting? After much weaving experimentation and hard work, Pendleton’s innovative Umatilla shirting fabric rolled off the loom. The rich colors in Pendleton’s woolen plaid shirts were completely new to the market in 1924. The positive response was immediate. It has also been enduring. Ninety years! To celebrate, we’ve released a poster that elaborates on the design features of our most enduring models. Click for a larger view, though the best view is in person at one of our many retailers. Here’s the styles you know and love in photos. 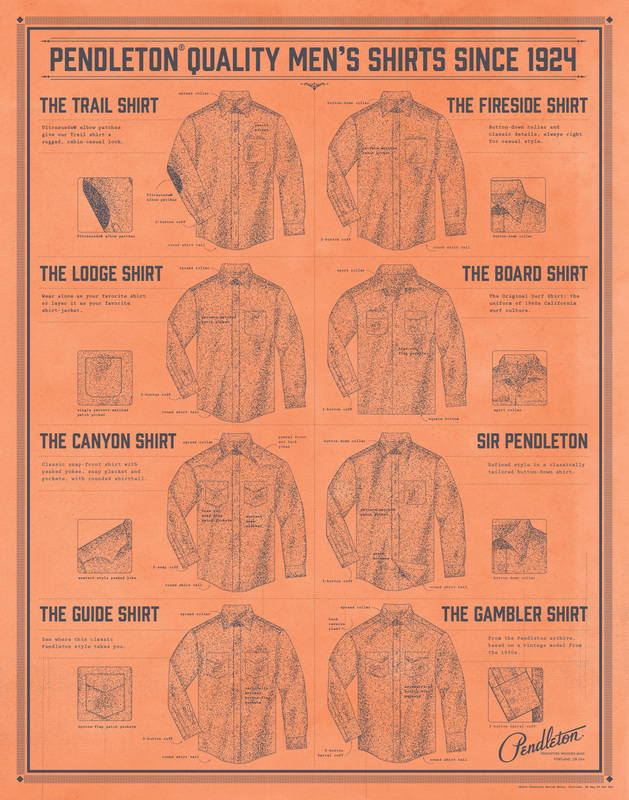 Fall 2014 brings our Decade shirts, each made a style and fabric that represents a decade of Pendleton shirtmaking. We will be taking a closer look at those in the next few weeks. But for now, it’s kind of awesome to sit back and consider how many Pendleton wool shirts we’ve put on the backs of men over the last ninety years. Thank you for your loyalty, and here’s to the next decade! NEVER STOP PRODUCING THE PRIDE OF AMERICA! THE PRICES ARE ASTRONOMICLY HIGH BUT WELL WORTH IT. You can also sign up for our apparel catalogs at the website, but sometimes the Sir pendletons are offered online only.